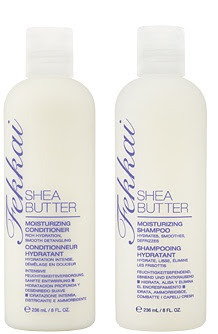 Babblings of a Mommy: Hair Week: Fredric Fekkai Shea Butter Moisturizing Shampoo & Conditioner. Hair Week: Fredric Fekkai Shea Butter Moisturizing Shampoo & Conditioner. In my endless search for the perfect shampoo and conditioner I stumbled upon Frederic Fekkai's Shea Butter Moisturizing collection. This shampoo and conditioner stood out far more than the others I've tried over the past few months because it leaves my hair so incredibly soft and moisturized!! It really is ah-mazing. Soft. Supple. Run your fingers through the difference. New Moisturizing Renewal Complex and Shea Butter moisturize from root to tip, protecting against dryness and brittleness. It works miracles on my thick frizzy color treated hair. I mean, it's crazy how good it is! It makes my hair look and feel super moisturized and hydrated. I don't think my hair has ever looked better. In fact, I even got compliments for my hairdresser last week and she told me to keep using whatever I was using because my hair looked great! Plus the smell is absolutely delicious. It's pricey. ($23 for each to be exact.) But well worth the money, if you ask me. I bought mine @ Ulta and was lucky enough to have been able to use a coupon, otherwise it would have been pretty steep bill. The good news is that little bit goes a long way so you won't have to worry about buying a replacement soon.